HÀ NỘI — Air quality in Hà Nội today was poor, with the somber sky covered in a fog-like sheen, reported Tuổi Trẻ (Youth) newspaper. The city’s air quality index (AQI) was recorded at between 138 and 185 in the morning. Anything above 150 is considered unhealthy for everyone. According to environmental experts, the problem was exacerbated by current air temperature conditions. Normally, higher layers of air in the atmosphere have a lower temperature but on some winter days, higher layers have higher temperatures. Hoàng Dương Tùng, president of Việt Nam Clean Air Network, said that when the phenomenon happened, air quality was worse. “The reverse heat layer would prevent pollutants from spreading high, so pollutants are trapped in the lower layer, causing heavy air pollution”, said the expert. This phenomenon created a misty and oppressive atmosphere. 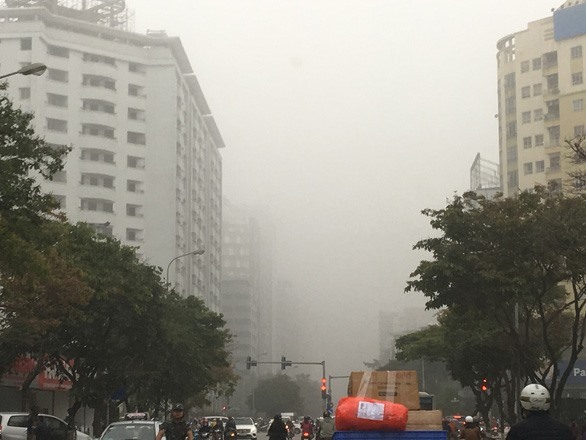 Trần Quang Năng, an expert of the National Centre for Hydrometeorology Forecast, said that the cold weather was weakening in Hà Nội and the somber sky was not due to fog. “It was due to air pollution,” Năng said. Năng said the misty weather would end after heavy rains, a cold snap or sunny weather. The current weather would be lasted for two or three days more, said Năng.